After the Missouri spring game, it became obvious James Franklin was going to be the number one quarterback. 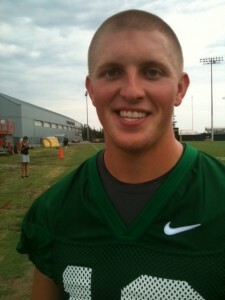 That is when Tyler Gabbert decided it was time to leave Missouri to compete somewhere else. However, that left the Mizzou coaches with not a lot of options behind Franklin. They had Ashton Glaser and some incoming freshmen, including Lee’s Summit Corbin Berkstresser. That’s when offensive coordinator David Yost approached Jimmy Costello. Costello as Blaine Gabbert’s backup and a senior last season. After being approached about coming back for a fifth year to add some experience at the quarterback position, Costello put off life’s plan for a little while longer.